Repairs and upgrades to existing Plantation screen enclosures and sunrooms played a big role in an increase in Plantation sales volume for the first half of 2013, said Chris Noe, president of Venetian Builders, Inc., Miami. First-half 2013 sales in Plantation topped those for all of last year in the Broward County community, Noe said. A patio cover by Venetian Builders, Inc., Miami. 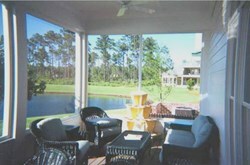 Homeowners with patio covers shelter themselves from sun and rain when outdoors. Owners of older patio covers may want to upgrade. We have upgraded older screen enclosures and patio rooms to meet today’s tougher standards. The abilities of Venetian Builders, Inc., to upgrade sunrooms and screen enclosures that were built before the current Florida Building Code went into effect helped to boost residential work in Plantation, Fla., during the first half of 2013, Venetian President Chris Noe said today. “Upgrading older screen enclosures is an especially good idea for homeowners who want to preserve the integrity of their home additions,” Noe said. Venetian designs and installs aluminum sunroom additions, patio roofs, patio covers and screen enclosures in Palm Beach, Broward and Miami-Dade counties, and in the Keys in Monroe County. It is the exclusive installer of those structures for 41 Home Depot stores in South Florida. Among the upgrades Venetian can perform are the installation of stronger gussets, heavier-duty stainless steel fasteners, additional corner bracing, other frame strengthening and new screening. Upgrades on older facilities are especially important for homeowners living in high-wind areas, such as along canals, lakes, ponds, parks and golf courses, Noe said. Venetian offers written, detailed, free estimates on repairs and upgrades, as well as on installation of Florida rooms, patio enclosures, aluminum or wood patio roofs, and swimming pool screens. For more information call 866-596-2427. The addition of custom-fabricated bracing plates and cross members helps aluminum structures stand up to hurricane-strength winds. Finishes match existing colors. Venetian Builders, Inc., Miami, installs custom-designed sun rooms, patio roofs, patio covers and pool screen enclosures in all South Florida communities.